We are so into MOOCs now that it’s too much for me. Gotta apply Ockham’s Razor 2.0 to this stuff. At the Ed-Media conference, I attended a session by Sarah Schrire of Kibbutzim College of Education in Tel Aviv. In her discussion of Troubleshooting MOOCs, she noted the dificulties in determining her own direction in offering a MOOC in the “Stanford model” MOOCs versus the “connectivism” MOOCs. I found myself breaking it down into three categories instead. Each type of MOOC has all three elements (networks, tasks and content), but each has a goal that is dominant. Network-based MOOCs are the original MOOCs, taught by Alec Couros, George Siemens, Stephen Downes, Dave Cormier. The goal is not so much content and skills acquisition, but conversation, socially constructed knowledge, and exposure to the milieu of learning on the open web using distributed means. The pedagogy of network-based MOOCs is based in connectivist or connectivist-style methods. Resources are provided, but exploration is more important than any particular content. Traditional assessment is difficult. Task-based MOOCs emphasize skills in the sense that they ask the learner to complete certain types of work. In Jim Groom’s ds106 at UMW, the learning is distributed and the formats variable. There are many options for completing each assignment, but a certain number and variety of assignments need to be done to perform the skills. Similarly, our POT Certificate Class focuses on different topics for each week, and skills are demonstrated through sections on design, audio, video etc. in an effort to expose learners to many different formats and styles in online teaching. Community is crucial, particularly for examples and assistance, but it is a secondary goal. Pedagogy of task-based MOOCs tend to be a mix of instructivism and constructivism. Traditional assessment is difficult here too. So I’m rejecting both the Good vs Bad MOOC model, and the million-points-of-MOOC approach, and going for a triad. This taxonomy is so helpful, especially when so many terms are floating around, not always with terribly clear definitions. It also helps to disrupt the cMOOC/xMOOC binary that I think we may have overly relied on in our #moocmooc conversations so far. Lisa, this is fantastic: I can definitely see this as a very useful way to organize the MOOC landscape, and just the OC landscape for that matter. My online courses are task-based, with networking to support those tasks. Just as an aside, it is the lack of attention to skills and skill-related tasks that is really hampering the Coursera course I’m participating in right now. Unlike some of the other Coursera courses, this one is writing-based (no quizzes, no tests), rather than being really content-focused (that’s what attracted me to it, in fact) – but it’s based on the assumption that the students already have all the writing skills they need… but they don’t. This is definitely a very helpful way of looking at MOOCs. I tried a different approach in my blog post on a MOOC undefinition. I went for more of a feature analysis to help someone decide how close they are to a MOOC whith what they are doing. But this cuts nicely through a lot of confusion. 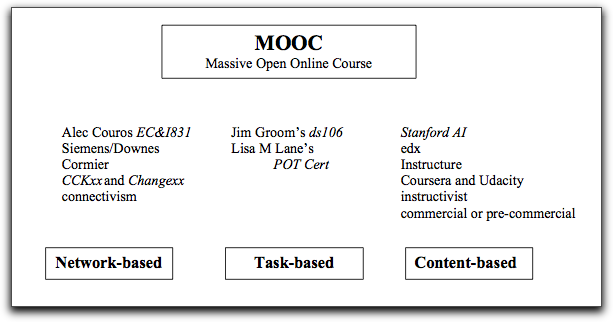 I like the idea of certain MOOCs being task based, and I think ds106 is definitely that. In fact, part of the fun is sitting back to imagine a animated GIF, but also enjoying the work so many others do. Deep inside I also hope people are wondering about managing their own space and thinking about the platform they are working on. I would hope there was a bit of meta on the idea of the power they have to build a platform. To create a community. The story of the MITx class in India is perfect, it blows my mind. I guess that is what I want to see from some discussion, how you create an experience that asks people to take a stake in who they are on the web creatively, personally, and intellectually. I continually think the story becomes people’s lives and the deeds they do that we can experience. I dunno Jim – I see ds106 as network based – in that rather than just saying to yourself “oh, I’m gonna make a radio show” there are lots of people who pick up on that and convince you to actually do it. The tasks are often self-imposed, the network is what convinces you to stop thinking about it and to make art (dammit). But that’s just me… there’s as many ways to take ds106 as there are adherents, and – fundamentally – it’s your course and what the hell do I know? I’d say ds106 is a ds106 type of MOOC! I agree ~ another word for it then (please no learning artifacts or object)… most that come to mind have “chore” associations. Chasing cars? “Activity” might be better than “tasks”, but it didn’t seem focused enough. I’m with Alan that calling it a ‘task’ doesn’t feel so ds106. The ‘Make Art Dammit!’ mantra has in it a probable substitute in that we focus on ‘making’ which I find more appealing. And it bridges into the building of one’s digital identity as well as the animated GIFs, MacGuffins, etc. The other distinction that I haven’t found a good way of making (and the triad doesn’t really get me there, either) is that only the ‘content-based’ MOOCs seem to be a Course with a capital C. By that I mean a focused package, a clear topic, strong steering, endpoint, etc. The others are more hubs of activity, which radiate out in various unintended directions. It’s this distinction which makes me not mind the binary approach, since I find it more significant (“What’s a ‘course,’ and why do I want it?”) than the task/content/network distinction. Well, ds106 is a Course in this sense, at least in terms of time and a focus. So was CCK08, at least for credit. So is POT Cert. All have a set period of time (so they’re courses rather than communities or websites or social networks). Thank you for this blog post. Your classification system is rather elegant, and extremely useful. I am a fan of adapting MOOC concepts and tools for classes, and you three part system has inspired me to reconsider some of my own notions about MOOCs. Lisa – thanks for this useful insight. The identification of the predominant element in a MOOC is also identifying the underlying learning/teaching paradigm, as you state. Is it this aspect that is the differentiator? ie is each MOOC’s underlying learning/teaching assumption (connectivist, constructivist, instructivist) what makes the difference? Goerge, I do think that much of the conversation is overly focused on who or what institutions are offering or sponsoring the MOOCs, who the students are (and how many drop out), who makes the money (or not), what the students get at the end, and what the intention is of the institution in offering a MOOC. I wanted to focus on the pedagogy and the intention of the course itself as the framework. It may not break down simply into instructivist, constructivist, connectivist pedagogies cleanly, but one is certainly emphasized over the other two in each. I’m also thinking further on Alec Couros’ EC&I831, and remembering the assignments and due dates. I’m wondering whether I shouldn’t move it to task-based, even though community was critical. The content-based MOOC is, in my opinion, close to the transition from the face-to-face –> online courses –> MOOC. The task-based MOOC (or learning activity based MOOC)are a great innovation of the traditional online courses in a constructivist perspective. Network-based MOOC are closer to a collaborative and research perspective, which places many more demands on participants with ability to work independently and collaboratively. Very good Lisa but I think that there are 4 type of MOOCs, and only 3 types are available nowadays. Many classification of education concepts exist. Concepts like e-learning, blended learning, distance learning refer to the use of technology in where learning takes place (class-room / online) and the role of technology by what means learning is ‘delivered’ (ict, internet, books, etc.). Another important descriptor is about how you learn. In that case important dimensions of learning are chronology (i.e., synchronous and a-synchronous intervention), roles each have in education (e.g., multi-disciplinary groupings of learners), the focus / different aims, direction (instructor-directed versus learned-directed), personalisation, the openness of education, etc. These are all important dimensions but eventually it comes down to four basic approaches how to teach. These 4 approaches can be coupled to 4 different kind of MOOCs. 2.People learn by constructing ideas and skills through active discovery. For example by exploration, experimentation, guided discovery, problem-solving, reflection, etc. Constructive learning leads to integrated skills and deep understanding. The task-based MOOCs Lisa introduces indeed centred on skills using a variety of different tasks and assignments. Most tasks in these MOOCs lay emphasis on active discovery by students. Some assignments are still based on associative learning but most are based on the approach Constructive learning. In my opinion we should not use term Task-based MOOCs because in all approaches the students have task and assiganment. The difference depends how open, how complex and authentic such a task is. 3. People learn by constructing ideas and skills through dialogue. For example by discussion, debate, collaboration, shared knowledge-building, etc. Social constructive learning also leads to integrated skills and deep understanding. The main approach of the orginal MOOCs is Social constructive learning although elements of constructive learning are also present (i.e., exploration is more important than any particular content). 4. People learn by participating in communities of practice. For example by apprenticeship, work-based learning, legitimate peripheral participation, learning networks, etc. Situated practice leads to the development of habits, values and identities. Hence MOOCs using the approach of situated practice are missing. MOOCs to be developed under this approach can be linked to massive simulation and/or games (MMO and MMORPG? ), to networked learning i.e. learning in massive online learning networks or to concepts like VirtualInternship and VirtualBusinessLearning. All approaches listed above emphasise the importance of leaner activity, constructive alignment of activities with desired outcomes, the importance of feedback opportunities for consolidation (practice) and integration. However, they differ in the role and importance of other people, the authenticity of the learning activity, the formality of activity structures and sequences, the emphasis on retention/reproduction or reflection/internalisation and the locus of control. konzeptblog » Webhochschule statt Volkshochschule?